Publishing Director: Isabelle Masson Mandonnaud, President. Access to the Site and all orders, are subject to these General conditions of Sale. We recommend that you read them carefully. These General conditions of Sale apply to any use of the Site and are also intended, on the one hand, to give you information about online sales and delivery of products ordered on the Site and, on the other hand, to provide you with information about your rights and obligations in the context of the sale of these products. They apply, without restrictions or reservations, to all sales of all of these products, including gift certificates and salon sales, offered on the Site. The Site is accessible through the Internet, and is open to any Internet user. You are responsible for the installation of computing equipment and the related expenses required to access the Site. Parfumaré shall not be liable for any damages resulting from use of the Internet, specifically, but not exclusively, due to bugs, computer viruses or service interruption. All sales through the Site are reserved to users who are non-commercial, physical persons, of legal age with the legal capacity to contract. Use of the Site, and any order submitted by the internet users or buyers (hereafter, the “Customer”), are governed by these General Conditions of Sale. As a result, the Customers state to accept all of the provisions of these conditions, without restrictions or reservations. By visiting and navigating on the site www.sabemasson.com, the Customers undertake not to use the site for any illegal or prohibited use, specifically in order to obtain, or attempt to obtain, unauthorized access to a password-protected area of the site, or too access the Parfumaré information system by hacking or by any other means. Access to the site confers a private and non-exclusive right of use on the Customers. This Site and all of its content, specifically the brands, texts, logos, designs, images, sounds, etc., are the property of Parfumaré, and are protected by the provisions of the Intellectual Property Code. Any use of the content, trade names and trademarks, specifically, their reproduction, representation, or, in general, their exploitation, all or in part, by any means and on any medium whatsoever, without the prior, written agreement of Parfumaré, is prohibited and constitutes an act of infringement, punishable both criminally and civilly. Likewise, the creation of Internet links to or from the Site, the creation of “mirror” sites that include all or part of the Site, is strictly prohibited. Parfumaré Customer Service : 4 rue de Franche Comté, 75003, Paris, France. Prior to placing any order, the Customers may learn about the essential characteristics of the product(s) they are interested in, on the website, by clicking on the product. Some products may be limited in quantity per order. A telephone number is also available to the Customers, so they can obtain any additional information about the product (this is a toll call, to be made at the Customers’ expense.) This is done so that the Customers can become familiar with the essential characteristics of all of the products we offer for sale before placing any order. Parfumaré does everything it can to ensure that the Products represented on our website faithfully represent the Products we deliver. Nonetheless, in order to ensure that our website is legible, the product images are not reproduced to scale, since they are presented on the Internet, so that Parfumaré cannot guarantee that the delivered product will correspond, in every detail, to the Customers’ perception of it at the time they placed their order. Description, illustrations, references, characteristics, content, specifications, price and availability of any product are subject to change without prior notice. The products offered for sale are those that appear on the website at the time that the Customers visit it, and are limited to available inventory. Parfumaré reserves the right to limit available quantities, without prior notice, to pull any product from the group of products it offers for sale, to modify, improve and change its products. Some products displayed or described on the site may not be available or may not be authorized for sale in every country. If a product becomes unavailable after the order is placed, Parfumaré shall inform the Customers by email as soon as possible, that the expected delivery will only be for a partial quantity, or will be canceled. If the Customers’ bank account or PayPal account has been debited and it has not been possible to complete the order, Parfumaré undertakes to reimburse the amount corresponding to the undelivered products to the Customers, at the latest, within the 30 days following the drawing of this amount from their bank account or PayPal account. Applicable prices are those listed on the Site at the time that the Customers confirm their order. Prices are listed in Euros and are understood to include all taxes. Parfumaré reserves the right to implement different prices, depending on the country of delivery, and to modify the price of its products, without prior notice, but without, nonetheless, allowing such modifications to affect orders that have already been accepted. Applicable delivery expenses that are the responsibility of the Customers are listed as such on the order summary, which is presented before order confirmation. These delivery expenses vary by the country where the products are delivered and by the delivery means chosen by the Customers. The Customers must create an account, with a user name and a password, in order to access certain pages of the site, and in order to purchase the products displayed there. For this purpose, the Customers shall undertake to supply their complete, current and precise information, and to keep it up to date. - A complete postal address, where deliveries can be made, and the surname(s) and first name(s) of the recipient, if different than those of the Customers. This information is necessary to properly process and deliver the Customers’ order. No Customers account can be created, nor can any order be submitted, if any required statement or information is missing. The Customers are solely responsible for the confidentiality of the user name and password they use to access their account on the Site. The Customers shall undertake to not reveal either their user name or password. The Customers acknowledge that they are completely and solely responsible for any activity or action taken using their Customer account, whether or not they authorized any such activity or action. The Customers must immediately inform Parfumaré of any unauthorized use of their account. By clicking on “Proceed to Check out”, the Customers undertake state understanding of these General Conditions of Sale, by checking the box “I have read and I accept the General Conditions of Sale,” and for payment for their order. No order can be validated if these conditions are not accepted. The Customers’ double click validating the order constitutes an electronic signature that is the equivalent, between the parties, of a handwritten signature. Once the order has been validated, and the General Conditions of Sale have been accepted, the Customers are redirected to a secure Internet page, in order to pay for their order online. - By Bank Card (Blue, Visa, Eurocard/MasterCard). The transaction is completed securely through the PayPal payment service. All data input at the time of payment by bank card is immediately encrypted by the SSL protocol and recorded on the PayPal server. No confidential payment data is stored by Parfumaré. If an item is returned, re-imbursement will be credited to the account used to pay the original order. - By PayPal. This means of payment is offered to Customers who have a PayPal account. Personal and financial information is automatically encrypted when any sensitive information is sent to the PayPal servers. . If an item is returned, re-imbursement will be credited to the PayPal account used to pay the original order. The Customers guarantee Parfumaré that they have the right to use the means of payment chosen. If the banking institution refuses payment, the order is automatically cancelled, and Parfumaré informs the Customers. Furthermore, Parfumaré reserves the right to take all useful legal actions. Parfumaré remains the owner of the merchandise ordered by the Customers until complete payment of the corresponding price. Parfumaré also reserves the right to suspend any order from a Customer with whom there exists a payment dispute regarding a previous order. When payment is validated, a printable detailed receipt, electronic ticket, or order confirmation, is sent to the Customers’ email address within a maximum period of forty-eight (48) hours. This ticket or confirmation includes all of the order references, the exact amount invoiced, the delivery means for the order and the power of the Customers to withdraw. Parfumaré recommends that you save this information. Contractual information is subject to email confirmation before delivery. Any incomplete or erroneous order, or any order paid by fraudulent use of a bank card, will be denied. Computerized records, saved on Parfumaré information systems under normal security conditions, will be deemed proof of communications, orders and payments that occurred between the parties. Your order can be delivered in the following Countries or regions: mainland France, overseas territories (except Martinique and Guadeloupe), Corsica, Monaco, United-Kingdom, Holland, Germany, Austria, Portugal, Italy, Cyprus, Croatia, Estonia, Greece, Hungary, Ireland, Latvia, Lithuania, Luxembourg, Malte, Poland, Czech Republic, Romania, Slovenia, Slovakia to the delivery address stated by the Customers at the time the order is processed. Delivery costs vary by country of delivery and by the total weight of the order. Expenses related to delivery are listed in the Customers’ order summary before its validation. The Customers are deemed to have agreed to related delivery expenses when they validate their order, and to having undertaken to pay these expenses. Colissimo Expert International or overseas, depending on the country of destination. These time periods run beginning with the first working day following receipt of payment. Orders submitted and validated on Friday, after 07.00 am, until Monday before 07:00 am, will be shipped Monday evening. Delivery is performed by a third party service provider (the “Service Provider.”) The Customers acknowledge that Parfumaré cannot be held liable for failure to deliver, poor execution of delivery or late delivery if these events may be attributed to the Customers (as an example, due to an incomplete or incorrect address), to the Service Provider or to an occurrence of force majeure. Nonetheless, we ask the Customers to inform Parfumaré in writing of any delay in delivery so that the Service Provider can perform the necessary investigations. If the period for delivery is exceeded by more than ten (10) working days for reasons attributable to Parfumaré, the Customers may request cancellation of their order at no expense by contacting the Parfumaré Customer Service Department in writing. Depending on the means of delivery chosen, the order recipient may be asked to sign the receipt submitted by the Service Provider. When the Customers are absent from the delivery location, the recipient of the ordered product will receive instruction from the Service Provider to be followed in order to withdraw their Order or to request a new delivery. In all cases, delivery is deemed to have been completed at the moment when the Service Provider makes the Order available to the Customers (by handing it over, leaving it in the letter box, or at a recovery location specified by the Service Provider) or to any other person named in the order, with the Service Provider’s information system serving to attest to this. The Customers are therefore asked to track the progress of their parcel using the tracking service offered by the Service Provider. At the moment of reception, the Customers are bound to verify the contents of the parcel, to state any reservations or claims to the Service Provider in the case of delay or damage to the parcel, and to sign Service Provider’s delivery guarantee departments and to the Parfumaré Customer Service Department within a maximum of three (3) days. If not, the Customers are deemed to have acknowledged receipt of the products in a completely satisfactory state. The Customers have an exchange period of fourteen (14) working days, beginning from receipt of the order, to return any products with which they are not satisfied. All expenses borne for the return of the products, including the initial order delivery expenses, will be reimbursed by Parfumaré, expect the return delivery expenses that will be paid by the Customer. Reimbursements are processed within a maximum of fourteen (14) days beginning with the receipt of the shipping receipt or, in its absence, beginning with the date of effective recovery of the products. If the right of withdrawal is exercised after the date the products are shipped by Parfumaré, the return expenses due or products and inherent risks will be the responsibility of the Customers. Reimbursement is completed by crediting the bank card or PayPal account used for payment. The Customers acknowledge that if they do not follow the procedure described above, within the state periods of time, no reimbursement will be given. Any product returned damaged, incomplete, used, worn, consumed, even partially, will not be subject to reimbursement. In addition, the right of withdrawal is excluded for products that have been unsealed after delivery, which cannot be re-shipped for hygiene or health protection reasons. Parfumaré guarantees that is products are suitable for the expected use and will have no flaws or hidden defects rendering them unfit for their normal use. The guarantee offered by Parfumaré does not cover products damaged during shipping or due to improper use. This site is the subject of a statement to the National Commission for Computing and Liberties CNIL. The Customers are informed that the authorized processing of information, specifically, the management of users’ email addresses, was thesubject of a statement to the CNIL under the number 165078. Parfumaré must collect personal data in the context of creating a Customer account and of submitting orders. These data are intended for Parfumaré and are used in the management, execution, delivery of orders and their tracking (invoices, returns, withdrawals, guarantees.) This information is transmitted to Parfumaré partners, whose participation is required to ensure successful completion of Customers orders and deliveries (the transporter, banking institution, etc.) Information and data that may be followed by an asterisk (*) are required and necessary to ensure the successful completion of Customers orders and deliveries. Personal data are only stored for the duration that is strictly necessary for the purpose of the processing described above, namely for five (5) years for billing and delivery purposes and (3) years for marketing. 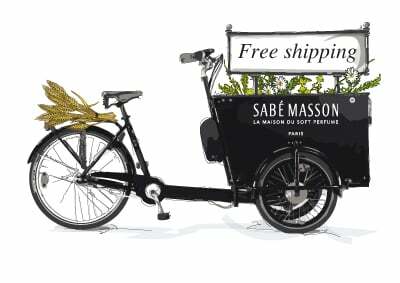 By enrolling on the www.sabemasson.com site, the Customers agree to receive electronic communications from Parfumaré, specifically, order confirmation, emails, emailing or product information. Parfumaré reserves the ability to use the data transmitted by the Customers for commercial purposes, if the latter agrees at the time their personal data is collected, by checking the following statements: “I would like to receive Parfumaré sales offers” and “I would like to subscribe to the Parfumaré partners newsletter.” In the opposite case, the Customers will not be the recipient of sales offers or newsletters. The Customers may, at any time, refuse to continue receiving the above-cited offers and newsletters by clicking on the un-enrolment link specified for this purpose for the offers and newsletters addressed to them. Parfumaré undertakes to protect its Customers’ privacy. The Confidentiality Policy applies to the collection, use and revelation of the personal data of all users of the Site, www.sabemasson.com, and Parfumaré will make every effort to store these personal data securely. By using the Site, www.sabemasson.com, the Customers acknowledge and agree to the processing of their personal data. In accordance with the latest GDPR laws The Customers have the right to access, correct, annoymise, delete and transfer the personal data that concerns them. The Customers also have the right to object, for legitimate reasons, to their personal data being processed. In order to exercise either of these rights, the Customers may send their request to Parfumaré at the following postal address: 4 rue de Franche Comté, 75003, Paris (France) or to the following email address: [email protected], and must document their identity (surname(s), first name(s), mailing address and email address, copy of identity document.) Parfumaré undertakes to process the Customers’ request as quickly as possible. The Customers also have the power to directly modify or correct their personal data by accessing their “My Account” Customer space on the Site, “sabemasson.com”. For the purpose of providing optimal service, Parfumaré places cookies on users’ computing equipment. A cookie is information deposited on your hard disk, by the server for the site you are currently visiting, namely http://www.sabemasson.com. This information is stored on your equipment in a simple text file, accessed by a server to read and record information. These cookies are specifically used to facilitate users’ access to their accounts, to store the shopping basket content until finalization of the purchase and to supply product information. Using these cookies, Parfumaré can also personalize your future visits, enabling you to save time finalizing your orders. Cookies can be deactivated. In addition, your internet navigator can be set to inform you when cookies are deposited on your equipment and to ask you to accept them or not. These settings are nonetheless liable to modify access conditions to the services offered on the www.sabemasson.com Site. The Customers may terminate their access to the www.sabemasson.com Site and close their Customer Account at any time, with or without reason, with or without prior notice. In the case of cancellation for any reason, access to and use of the Site will cease immediately. Parfumaré shall not be liable if non-execution or a delay in execution of one of its obligations described in these General conditions of Sale results from an unavoidable event or from the occurrence of an event of force majeure, such as, specifically, but not exclusively, floods, fires, storms, partial or total strikes and, more generally, any outside, unpredictable and irresistible event. If one or more of the clauses of these General conditions of Sale are ruled invalid under application of the law, of a regulation or of a court decision, the other clauses retain their full validity and effect. In addition, considering possible changes in regulations and of the Site, Parfumaré reserves the ability to modify these General conditions of Sale at any time. The new General conditions of Sale will be available online, on the Site, sabemasson.com, and will be applicable only to Site visits and sales completed after the undertaken modification. Any dispute regarding submitted orders, sales completed and the interpretation and execution of these General conditions of Sale shall be subject to French law, to the exclusion of the Vienna Convention regarding international merchandise sale contracts. Any difference or dispute, which may arise from submitted orders, sales completed, from the validity, interpretation or execution of these General conditions of Sale, and that could not be settled amicably by the Customers and Parfumaré will be submitted to the French courts, notwithstanding plurality of parties, and this, in summary based on the merits or expert opinion.